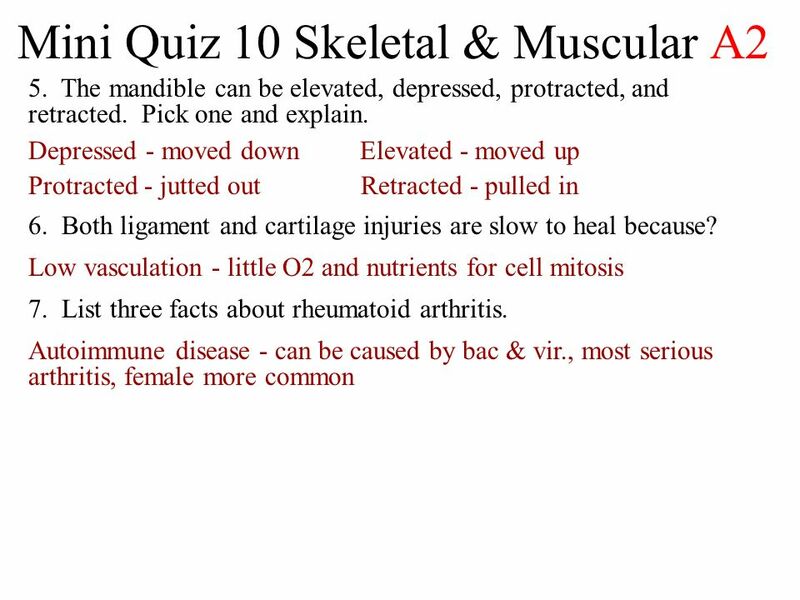 Mini Quiz 10 Skeletal and Muscular 1. What are two ways joints are classified? 2. What is the name given to the fibrous tissue sac filled with fluid found. 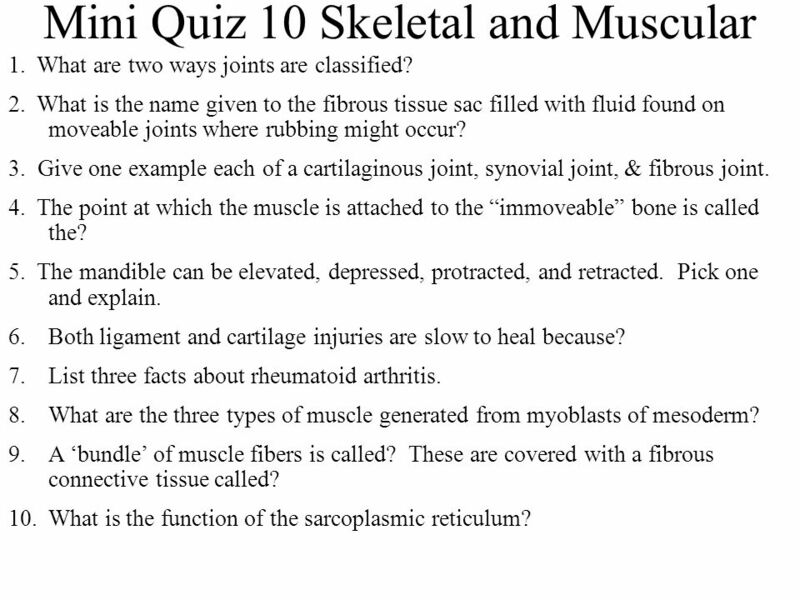 1 Mini Quiz 10 Skeletal and Muscular 1. What are two ways joints are classified? 2. What is the name given to the fibrous tissue sac filled with fluid found on moveable joints where rubbing might occur? 3. 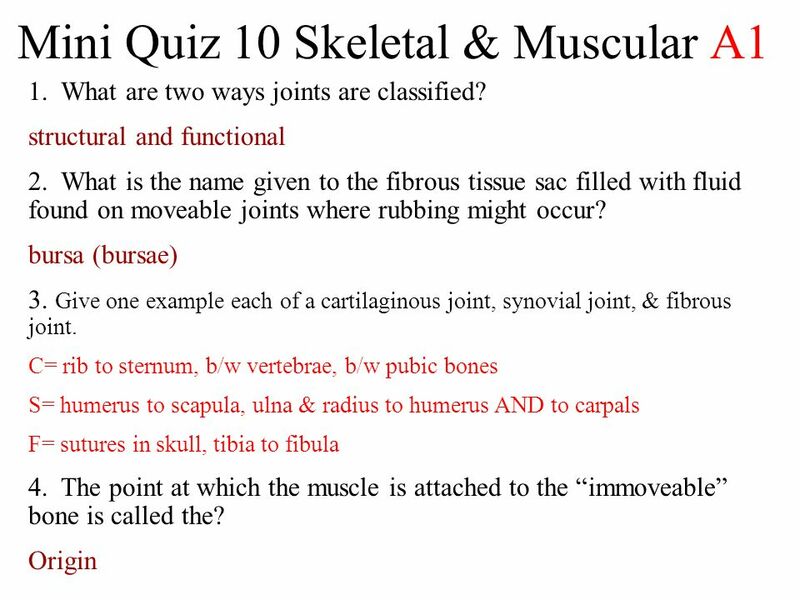 Give one example each of a cartilaginous joint, synovial joint, & fibrous joint. 4. The point at which the muscle is attached to the immoveable bone is called the? 5. The mandible can be elevated, depressed, protracted, and retracted. Pick one and explain. 6.Both ligament and cartilage injuries are slow to heal because? 7.List three facts about rheumatoid arthritis. 8.What are the three types of muscle generated from myoblasts of mesoderm? 9.A bundle of muscle fibers is called? These are covered with a fibrous connective tissue called? 10.What is the function of the sarcoplasmic reticulum? 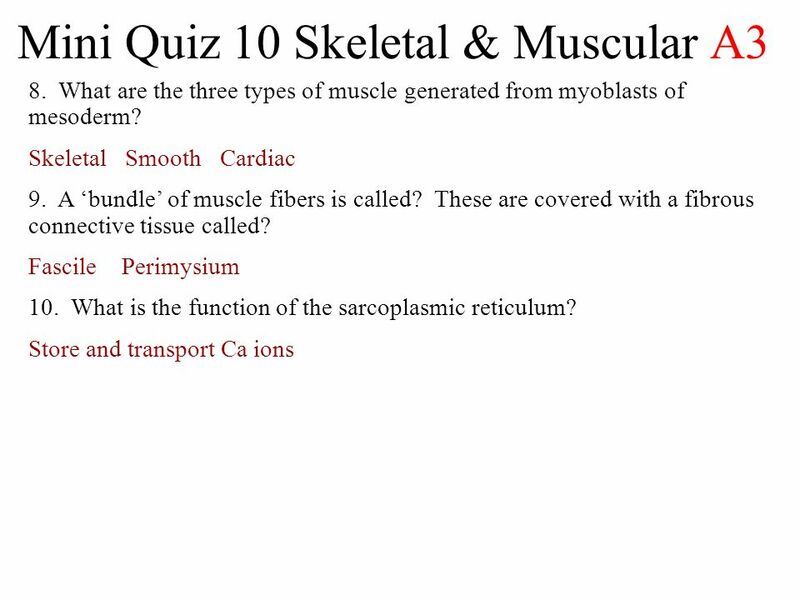 Download ppt "Mini Quiz 10 Skeletal and Muscular 1. What are two ways joints are classified? 2. What is the name given to the fibrous tissue sac filled with fluid found." 8 Joints. 8 Joints Objectives: Joints Define joint or articulation. Classify joints structurally and functionally. Describe the general structure of. Human Anatomy & Physiology FIFTH EDITION Elaine N. Marieb PowerPoint ® Lecture Slide Presentation by Vince Austin Copyright © 2003 Pearson Education, Inc.
Essentials of Human Anatomy & Physiology Copyright © 2003 Pearson Education, Inc. publishing as Benjamin Cummings Slides 5.45 – 5.55 Seventh Edition Elaine. ELAINE N. MARIEB EIGHTH EDITION 5 Copyright © 2006 Pearson Education, Inc., publishing as Benjamin Cummings PowerPoint ® Lecture Slide Presentation by.  Articulations of bones  Functions of joints › Hold bones together › Allow for mobility  Ways joints are classified › Functionally › Structurally. Joints Articulations of bones Functions of joints – Hold bones together – Allow for mobility Two ways joints are classified – Functionally – Structurally. Joints (Articulations) Weakest parts of the skeleton Weakest parts of the skeleton Articulation – site where two or more bones meet Articulation – site. Copyright © 2006 Pearson Education, Inc., publishing as Benjamin Cummings Human Anatomy & Physiology SEVENTH EDITION Elaine N. Marieb Katja Hoehn PowerPoint.  Provide shape and support  Protection of internal organs  Storing minerals and fat  Producing blood cells and platelets  Assisting with movement. CHAPTER 7 Joints. articulations Joints (or articulations) Where two or more bones meet Functions: movement, hold skeleton together Classified by structure.